Secretary of State Hillary Clinton backed away from her unqualified support of the Egyptian government on Wednesday, saying, “We believe strongly that the Egyptian government has an important opportunity at this moment in time to implement political, economic and social reforms to respond to the legitimate needs and interests of the Egyptian people.” The Obama administration appears to be rethinking its position in the region, worried that if popular revolts like that of Tunisia spread and succeed, the US will suffer from its support of the dictators unless it now at least urges them to democratize. Journalist Mustafa Sulaiman reports in Arabic from Cairo for the Dar al-A`lamiya al-`Arabiya that protests, having raged Tuesday and Wednesday, started back up Wednesday night in Egypt and that there were confrontations between security forces and protesters in Cairo and in its northwest suburb, Madinat Suez. Clashes broke out on Ramses Boulevard and Galaa St., and in central Cairo. Attorneys and journalists demonstrated in front of their guild offices, which are next to oneanother, on Abd al-Khaliq Tharwat Strreet, which was closed off by security barriers. Sulaiman writes that security forces arrested 8 journalists, among them (ironically) Muhammad Abd al-Quddus, the head of the Committee on Journalistic Freedoms at his guild. Protesters gathered in front of the High Court behind the offices of the Journalists’ Guild, while another crowd headed for al-Atabah Square. In the Mediterranean port of Alexandria, people assembled before the al-Qa’id Ibrahim Mosque. Struggles broke out between these demonstrators and the security police, and ultimately the latter used tear gas to disperse the crowd. In Suez, where 2 demonstrators were killed on Tuesday, he reports that thousands of people rallied in front of the morgue where the bodies were, shouting, “Long Live Suez, the Sidibouzid of Egypt!” (Sidibouzid is the town where Mohamed Bouazizi set himself on fire in protest, setting off the Tunisian revolution). He says that Egyptians report that Facebook was back on line in Egypt Wednesday night, after an outage that had lasted for several hours. (Facebook administrators had said that despite Egyptian reports of outages, their traffic in Egypt seemed normal). Twitter, on the other hand, was still inaccessible. The subway is still not stopping at the Maidan al-Tahrir (Liberation Square) at the center of the city, as a crowd control measure. AP says that in the southern city of Assiut, a small crowd of about 100 gathered, but were set on by police and half were arrested. Sulaiman reports that in that city, security forces arrested the Muslim fundamentalist activist Yusriya al-Shinawi, the sister-in-law of Dr. Muhammad Badi`, the director general of the Muslim Brotherhood, in the course of a demonstration in which she participated. Since Tuesday evening 122 Muslim brothers have been jailed (along with over 700 others). Protesters were also arrested in the Delta city of Mansoura. Back in Cairo, police cordoned off all the streets leading to Liberation Square, and the Interior Ministry for the first time deployed female police to search women pedestrians passing through checkpoints. Using women deprived the opposition of one of its accusations against the regime, that it had its secret police paw pious, innocent Egyptian women. A fourth demonstrator died in hospital in Suez, of injuries he received Tuesday. Also in Suez, according to Reuters Arabic, crowds tried to firebomb the local HQ of President Hosni Mubarak’s National Democratic Party. AP says that they also firebombed the police station, doing damage to both buildings. This report says that police fired into the air to disperse crowds near the High Court, and used crowd-control trucks against other rallies, breaking them up. A facebook page asking for demonstrations after Friday prayers on Friday immediately attracted 24,000 followers. 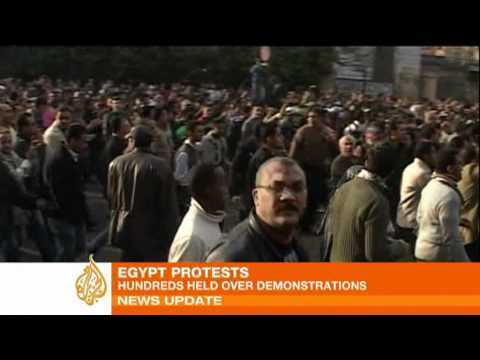 Aljazeera English’s Dan Nolan reports that there were confrontations between activists and secret police all over the city Wednesday night, though things had calmed down a bit by Thursday morning Cairo time.